The early history of Jan Mayen is rather obscure. Some historians believe that an Irish monk, Brendan, who was known as a good sailor, was close to Jan Mayen in the early 6th century. He came back from one of his voyages and reported that he had been close to a black island, which was on fire, and that it was a terrible noise in the area. He thought that he might have found the entrance to hell.Viking sailors are also believed to have known about the island. The first documented discovery of the island happened in the early 1600 when Dutch and English whalers sailed in the area in search of new hunting grounds. The island is named after the Dutchman Jan Jacobs May van Schellinkhout who visited the island in 1614. His first mate did some mapping of the coast and named the island Jan Mayen. The Dutch whalers established several whale oil boilers on the island where they extracted oil from the blubber of whales. When whaling was at its highest more than 1000 men were based on the island during the summer months. They also established fortifications on the island to protect their bases from plundering. Some years ago two big guns were found in the area where the main whaling station was. As a result of the hunting activities the Greenland whale nearly disappeared and whaling near Jan Mayen came to an end between 1640 and 1650.The island was deserted and for the next 230 years only a few ships visited the island. During the first International Polar Year in 1882-83 an Austrian/Hungarian expedition chose Jan Mayen as their base. They stayed for a full year and carried out extensive research and mapping of the island. Their map was in use until the 1950’s. At the beginning of this century Norwegian trappers began to spend the winters on Jan Mayen. Their main prey was blue and white foxes and an occasional polar bear. Overexploitation of the fox population resulted in a fast decline of the hunting profit, and in addition the barren island and unpleasant living conditions made the hunting come to an end in the 1920’s. Official Norwegian activity on Jan Mayen has been continuos since 1921 when the first meteorological station on the island was established. 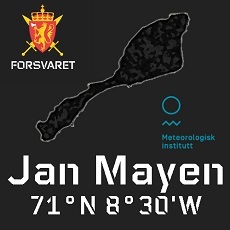 Weather reports from Jan Mayen are important for weather forecasting in Norway and the Norwegian Sea and in 1922 the Norwegian Meteorological Institute annexed the island for Norway. By Royal Decree of 8th May 1929 Jan Mayen was placed under Norwegian sovereignty and by law of 27th February 1930 the island was declared a part of the Kingdom of Norway. Jan Mayen was not occupied during the World War II, and remained as «Free Norway». In 1940 the crew of the met. Station burned down their station and left the island, but in 1941 they came back with a few Norwegian soldiers. They re-established the meteorological station and were in continuos operation throughout the war years in spite of frequent air attacks from the Germans. Two German planes crashed on the island during the war. A four-engine bomber with 9 crewmembers hit a mountain near the Norwegian garrison in 1942. In 1950 a party of British geologists found the wreck of a German plane with 4 crewmembers on the south-west side of the island. In 1959 all remains of the crews from the two planes were moved to the war cemetery in Narvik.In 1943 the Americans were allowed to establish a radiolocating station on the island. It was built on the north side and they called it Atlantic City. The main task of the station was to locate the secret German weather and radio stations on Greenland. Remains of the Norwegian main station during the war. After the war the Norwegian Meteorological Institute used Atlantic City as their station until 1949 when their new station was built on a rise above Atlantic City. In the period 1945 – 59 the only activity on the island was weather observations and this was supplemented by radiosoundings. That is balloons which are sent up to an altitude of 25 – 30 km carrying a package of measuring instruments and a small radiotransmitter which reports back information about temperature, pressure and humidity of the air together with information about wind speed and direction. The new station was also equipped and tasked to operate a coastal radio station. It maintained contact with ships in the area and relayed messages to stations on the main land. It also kept continuos watch for possible distress signals in the area. Over the years Jan Mayen Radio has been of great importance for the safety and welfare of fishing and seal-hunting ships. In 1959 a new era came to Jan Mayen. NATO decided to build a radionavigation system called LORAN, which stands for «Long Range Navigation». Jan Mayen was chosen as one of the transmitter sites working together with transmitters on the Norwegian mainland, in Germany, on the Faeroes and Iceland. The Norwegian defence Communication Administration (NORECA) was given the task to establish and operate the two stations in Norway. All machinery, building materials and equipment for the new station was transported by ship and since Jan Mayen has no harbour the load was landed by small boats and rafts, often in rough sea. This was both hard and difficult work, and not without danger. The new station was called Olonkin City, named after one of the real veterans of Jan Mayen. The building complex contains living quarters, mess facilities and most of the technical functions necessary to operate the station. In 1960 an Additional LORAN transmitter was installed. This required more construction work and in that period a small landing strip for aircraft’s was built. Since then most of the transports to the island have been with planes. The first plane landed on Jan Mayen in 1961 and since then we have had about twelve landings every year. In 1962 the meteorological station moved again to a site near the airstrip. Their crew are living in the NODECA station. Thus, all activity on the island is done along a 5-km long strip of the south-eastern shore. In 1960 the station crew was up to 40 men. Today this is reduced to only 18 people.